Vacuum Infusion in Boatbuilding. Skipper´s Essentials. Reading the various sailing magazines and high glossy brochures of the different brands one often stumbles upon the “vacuum infusion technique”. Yards are marketing their (pretty expensive) boats with that term, implying that a hull made by utilizing the power of Space would be something very special. But what´s vacuum infusion exactly and is this technical achievement really the non-plus-ultra in boatbuilding? Most sailing yachts are made of GRP, or glass reinforce fiber, which is in my eyes the most adequate material for making yachts: It´s convenient, plenty of it is available so it´s relatively cheap to acquire. This material is lightweight, relatively break-proof and if processed properly can last … well, it can last dozens of years, as you can see at my own boat, a 40 years old King´s Cruiser. Traditionally, layers of GRP are soaked in resin and hand laminated into a mold. This is done multiple times so that at the end after a drying process a rock-solid hull is made. When laminating, the worker will have to coast all along the laminate to squeeze out bubbles and to press the GRP matting onto each other. For some 40 years know boatbuilders have made strong, reliable and very beautiful yachts with hand lamination technique. Weight is – like with everything humans build – a crucial factor. So, having a strong but light hull is something that every boatbuilder desires. Clever people invented the so called “sandwich laminate”, which is essentially two relatively thin layers of solid GRP matting covering a light material in their midst. Traditionally, this has been Balsa. That´s a kind of wood which is very, very lightweight on the one hand yet can form a strong bond with the GRP. Nevertheless, Balsa-core has some downsides, of which it is its tendency to decay if submitted to water is the worst. Something I did had to experience by myself when I was refurbishing the chain plates of my own boat. 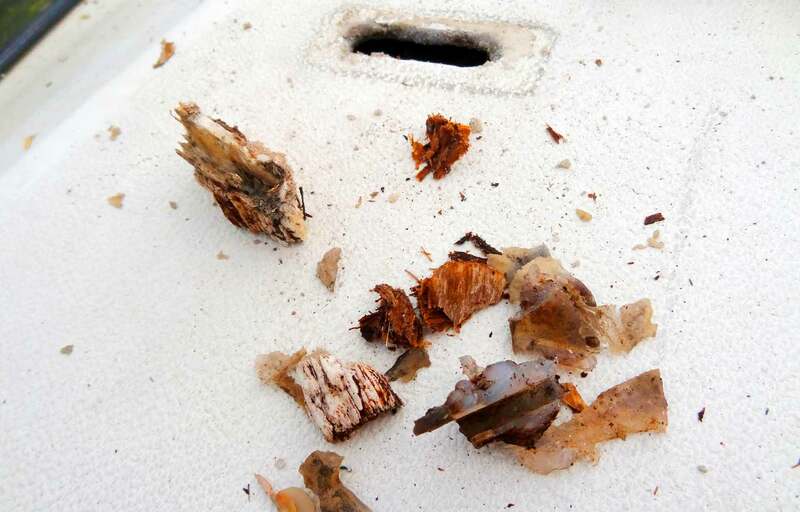 The Balsa-core has been rotting away within the sandwich laminate of the roofing of my boat. Anyway, if done properly and no exposure to water is insured, Balsa-core sandwich still is a material of choice in modern boat building. So what´s that fuss with vacuum infusion all about? Well, at first, another kind of material for the core comes into play: Foam. When I visited the Cranchi yard some days ago (read it here) I grabbed a piece of raw foam core matting. That´s a thin layer of GRP garment with a layer of some 1.5 centimeters thick solid foam. 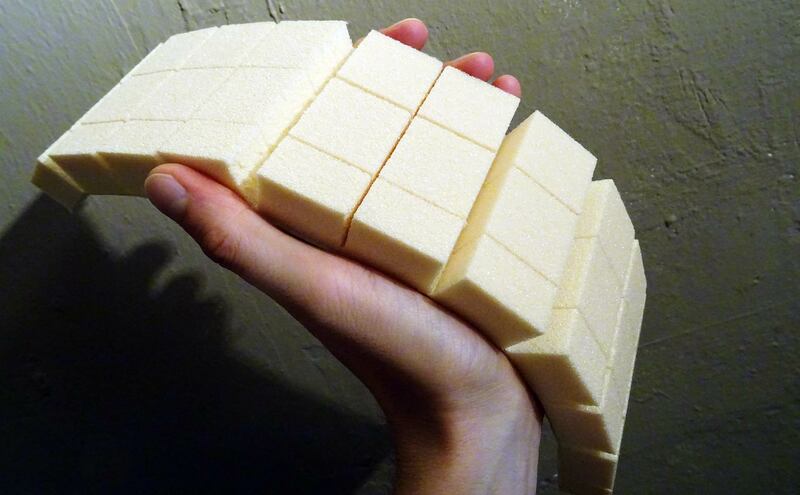 This foam has been cut into 1 by 1 inches wide squares. Now, how does it work? 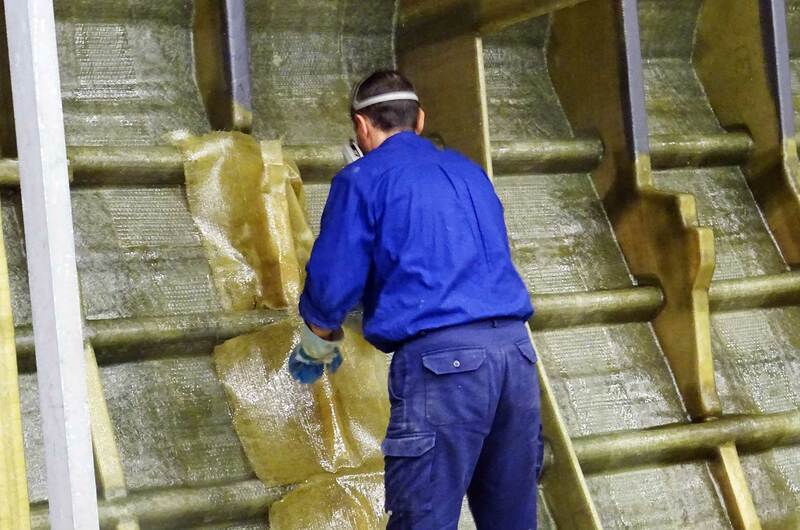 At first, Gelcoat is brought into the mold and the first solid GRP-mattings as usual. Then layers of this raw foam core – cut to proper size – will be brought into the form, also covered with some thin layers of GRP again. Then the whole mold is wrapped with air-tight thick foil. Draft tubing is connected with the foil and strong machines will extract the air from the mold. Thus creating a vacuum. Now resin is inserted into the mold in various spots. 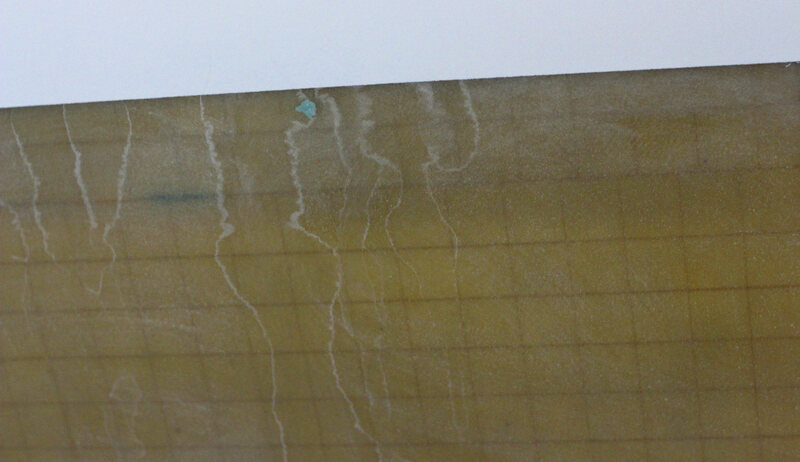 Due to the vacuum, this resin will creep and crawl in every corner of the GRP-matting and will also soak the foam core. When drying, not just the mattings but the soaked foam core as well will become as dry and as solid as bare plastic. That´s basically it. Is vacuum infusion a superior boatbuilding technique? Oh, and did I mention that hulls made with vacuum infusion are way more expensive than traditionally built? Even the non-baked? Bare hull made with vacuum infusion and foam core before painting. That´s an X-Yacht. At Cranchi yard in Italy, the head of production points to another fact: There is virtually no safe way to detect weak spots in the vacuum infused laminate after drying. Even X-Rays cannot make visible areas where bubbles have formed of where no resin could soak the foam. These are weak spots which can lead to structural failure. So, at Cranchi they won´t use vacuum infusion technique on vital parts of the boat, like the hull itself. “In the end”, Flemming Ancher of X-Yachts says, “vacuum infusion is the material of choice when it comes to high performance sailing racers.” And I would add by myself: As long as we do not attend Vendeé Globe or serious regatta racing, thorough hand lamination will certainly live up to our expectations. Currently, builders use end grain balsa, foam or PVC for core materials. 1. When end-grain balsa-core is used in a resin infused hull each 1” cube is encapsulated with resin so water cannot migrate through the natural grain to rot the core further than 1” if someone put a screw or cut a hole in the boat that allowed water into the core. 2. End-grain balsa provides superior adhesive bonding to fiberglass cloth over foam by forcing resin into the natural grain, delamination of the fiberglass skins to the core is greatly reduced over foam or PVC. 3. Most modern resign infused hulls have solid fiberglass in key areas like the chain plates and through hulls so water cannot damage the core. Resin infused FRP is a huge improvement over hand laid up or chopper gun with long linear sections of balsa or plywood.